The trouble isn’t really star Rami Malek, who gives a mesmerizing if opaque performance as Mercury. The problem is that the movie doesn’t have anything interesting to say. “What on earth is it about?” a secondary character asks at one point about the band’s new single, a genre-bender called “Bohemian Rhapsody.” What the movie’s about, apparently, is a standard rise-fall-rise story. If you’re ever banged your head on a car dashboard to the glorious operatic absurdity of that title song, of course, you may not care. (Mike Myers, whose “Wayne’s World” character re-popularized our love for Queen’s camp-rock in the 1990s, has a brief and funny turn as a clueless label executive.) And if you’re truly a fan, the highs of “Bohemian Rhapsody” may carry you over the sometimes cringingly generic rock-bio lows. Most of those highs come in the film’s first third, which doesn’t so much dramatize the band’s ascension to pop glory as whisk us along for the ride. Mercury is introduced in 1970 as an immigrant kid loading baggage at London’s Heathrow airport and nursing secret dreams of fame; his immigrant Parsi parents call him Farrokh, most Brits think he’s Pakistani, and only in his head is he Freddie Mercury. Not for long. Brazening his way into Smile, a neighborhood rock group headed by guitarist Brian May (Gwilym Lee, rangy and sane) and drummer Roger Taylor (Ben Hardy), Farrokh announces he’s the group’s new vocalist. “Not with those teeth, mate,” May says, and, in his defense, it’s never clear whether Malek is wearing the prosthetic Freddie Mercury choppers or they’re wearing him. But then May and Taylor hear that four-octave voice. Malek has cut a curious figure on TV’s “Mr. Robot” and elsewhere; he can use his large, lamp-like eyes and passive demeanor to suggest enigmatic passions roiling beneath the surface. 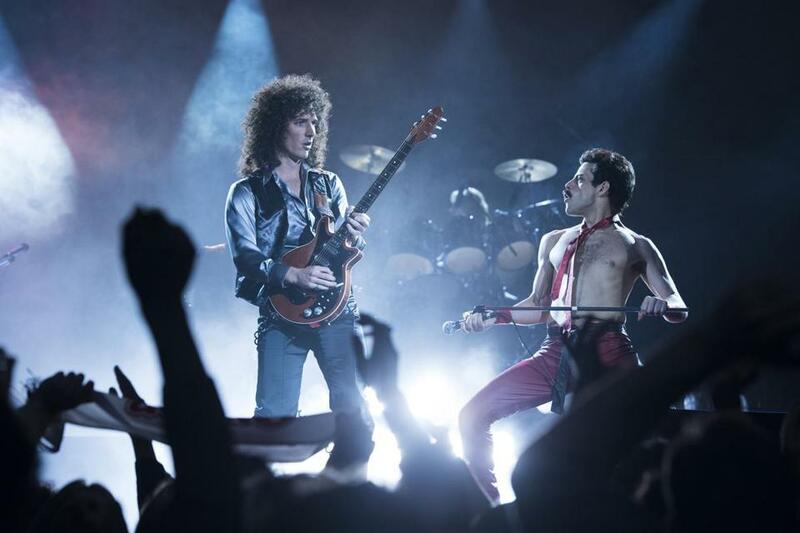 His Freddie is an oddball but a confident oddball, dragging his bandmates along as — according to this movie — he reinvents their name, their sound, and their success. A six-minute single combining arena-rock guitar riffs and multi-tracked fake operatic arias? No one thinks it’ll work — the montage of Taylor over-dubbing “Galileo!” about 42 times is rich — and even the other musicians aren’t sold on what they call “Freddie’s . . . thing.” Forty years later, we’re meant to chuckle with happy retro irony. And we do. The movie’s middle third finds Mercury retreating to a London mansion like a glam-rock Norma Desmond, attended to by a manipulative hanger-on named Paul Prenter (the appropriately named Allen Leech). The latter is a gay predator so cartoonish that he lacks only a mustache to twirl, and as he keeps the star from his bandmates and the rest of the world, “Bohemian Rhapsody” conjures up a leather demimonde that’s at times outright demonic. The sybaritic coke-fueled downfall scenes of “Bohemian Rhapsody” are saddled with awful dialogue. (“Freddie, you’ve been burning the candle at both ends.” “Yes, but the glow is so divine.” Edna St. Vincent Millay wants her poem back.) More to the point, the film’s second half seems so nervous about how to portray Mercury’s private life to a broader base of Queen fans — especially the group’s American arena-rock audience — that it develops a spirit-sapping split personality. As did the singer himself. At the end, we’re left with some great music, a central performance that never fully connects, and a number of spurious facts: Despite what the movie says, Mercury wasn’t diagnosed with AIDS until 1987, two years after Live Aid; he died in 1991. All in all, the movie’s a muddled and overlong experience, one that every so often drifts into dull, unintentional camp. Was intentional camp maybe part of the plan? The production of “Bohemian Rhapsody” was a fraught one, since director Bryan Singer (the “X-Men” movies) was fired and replaced by Dexter Fletcher with two weeks to go. (Singer gets sole screen credit.) The resulting movie has everything except a point of view. That its subject was a flamboyantly gay performer playing to the straightest of mass audiences is an irony the film’s not equipped to deal with — even if Mercury made it his life’s work. Directed by Bryan Singer. Written by Anthony McCarten and Peter Morgan. Starring Rami Malek, Lucy Boynton, Gwilym Lee. At Boston theaters, West Newton, suburbs, Jordan’s IMAX Reading and Natick. 134 minutes. PG-13 (thematic elements, suggestive material, drug content, and language). Ty Burr can be reached at ty.burr@globe.com. Follow him on Twitter @tyburr.